The story of the Library is included in our Capitol Hill Tour. Listen to a preview here and download the stop by itself or as part of the full tour! 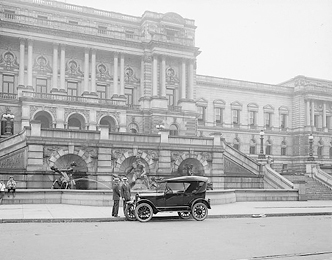 Enjoy the Library of Congress Tour by joining our Capitol Hill Tour! The Library of Congress is the biggest and baddest library on the planet, located at 101 Independence Ave SE, just North of the Capitol. With a gold-plated dome and Neptune, the Roman god of the sea, protecting its front, it would be hard to argue against the dramatic beauty of the Library of Congress. Formed in 1800, the LOC is the oldest federal cultural institution in the nation. If you made one bookshelf to hold all of its books, it would stretch from Seattle to San Francisco. Now that would be a real information superhighway!